Martha May Cage (Claussen), 91, passed away July 12 at Cypress Springs Alzheimer’s and Memory Care Center. She left this earth peacefully after a number of years of mental and physical decline. “There are people who, like houses, are beautiful in dilapidation.” She decided to enter a new mansion in the glorious presence of the Lord. Hallelujah. 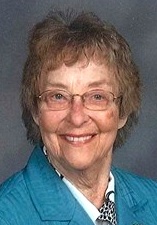 A life-long Lutheran, her moral compass was always pointed in the direction of the living, breathing Word of God. She was born December 26, 1924 in Gilmore City, Iowa, to Henry and Mildred (Lotz) Claussen and had seven brothers and sisters. She graduated from Gilmore City High School in 1942 and married her high school sweetheart, Gene Cage. They were married for 62 years, and had four sons, eight grandchildren, and seven great grandchildren. They lived in West Des Moines, Iowa for many years, then moved to Prairie Village, Kansas and finally to a five-acre homestead in Olathe, Kansas for retirement. She worked in the school cafeteria for 20 years in Prairie Village and then volunteered at the front desk of Olathe Medical Center for 18 years. She admitted having little time for hobbies with four boys in the house, but did spend a good deal of time with Gene in gardening and canning the produce. She also liked to play bridge and square dance. Her favorite type of music was bebop and polka. They collected antique furniture together and she also collected clowns, dolls, mugs, and “cracked glass” vases. She hand-painted ceramic figurines and regularly gave these away as gifts. Martha said her proudest achievement in life was her family. On yearly family vacations they visited all the National Parks and camped out, providing unmatched experiences and memories for the boys. Martha is survived by her sons, Brian (Diana), Kent (Sheila), Neal, and daughter-in-law Charlene. Grandchildren Kirsten Sobol (Barry), Elliott Cage (Lisa), Tarah Yates (Tom), Laura Cage (Tristan Gangel), Quentin Cage (Deanna Vogel), Evan Cage (Lindsey), Emily Cage, and Thomas Cage. Great grandchildren Jaden, Ethan, Isabella, Isaac, Taylor, Cooper, and Shamus. As well as a gaggle of nieces and nephews. She was preceded in death by her husband Gene, son Curtis, and siblings and spouses Herman & Vivalore Claussen, Vernon & Ella Claussen, Clifford, Catherine & Maxine Claussen, Carol & Percy Grove, Iola & John Cran, Madora & Raymond Graaf, and Marian Benjamin. Memorials are suggested to St. Mark’s Lutheran Church, Olathe, KS.